Ladies don?€™t get caught with your usual work purse the next time you?€™re at The Swamp. Instead sport this cute and convenient Hipster purse that features your one and only Florida Gators. This purse is covered in Gators wordmarks and features royal blue and orange team accents to make your unbeatable style and team dedication stand out. There are plenty of pockets throughout the purse and its versatility allows you to wear the bag on your shoulder or across your chest. The front also features a Florida patch including the team name and establishment date so no one can confuse who you?€™re rooting for. 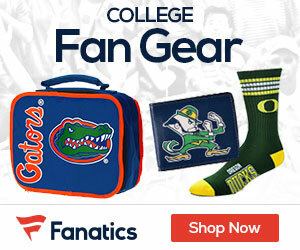 Show off your team spirit for the Gators and tote your essentials whenever it?€™s game day! Ladies tote all your personal belongings in true Gators spirit with this classy Executive purse featuring natural woven fabric embroidered lettering and logos and team-colored leather accents! This tote has a top zip closure two inner slip pockets and both an interior and exterior zip pocket so you can keep your keys cell phone makeup and other important items close at hand. Ladies get Gators style with an edge when you tote around this Caprice handbag. Featuring tonal printed team graphics surrounded by tattoo-inspired flourishes this handbag will add just enough team spirit to your current classy ensemble! Ladies tote all your game day essentials in true Gators spirit with this classy Executive purse. It features natural woven fabric allover embroidered team graphics and team-colored leather accents so you can always keep your everyday necessities and your team pride at hand! You don?€™t need some flashy bag to carry your daily necessities. You need a bag that?€™s simple stylish and lets you express your die-hard Florida Gators fanaticism. This is precisely why you?€™ll love this UF hoodie cinch bag. Sturdy polyester-lined and featuring double drawstrings on either side and a distressed Gators logo printed on the front this stylish bag has enough room for you to tote around all your bare essentials. Ladies perfectly complement any team-spirited outfit with bona fide Gators style when you carry this chic faux leather hobo purse. Boasting a metal logo on the front and team-colored shoulder straps it’s a super trendy look that you can flaunt on any occasion. Does this sound familiar? You wake up late for your class scarf down breakfast hop in the shower get dressed and right when you are about to walk out the door you stop because you realize your accessories don?€™t match your outfit. You?€™re already running late but you can?€™t risk not looking at your best. You try to decide what to do change outfits or move everything from one purse to another. This Florida Gators handbag can solve those problems! Made for the ultimate Gators fan in mind it?€™s decked out in team colors with the Gators logo on one side for that look of class. Inside there is plenty of room for whatever you may need for the day! So don?€™t worry about color coordinating with your accessories again in the morning; this handbag will match any of your styles! Ladies you have an old faithful bag you carry everywhere. The only problem is that it doesn?€™t showcase your Gators pride. Plus you?€™ve lost at least 20 bucks’ worth of change in the lining! That is why this Florida Grommet hobo bag has your name written all over it (metaphorically speaking of course). This team-colored nylon bag features cool grommet detailing on the side a domed Gators logo on the front a durable across-the-body adjustable strap for comfort and multiple interior pockets so you can carry this bag while running errands or cheering on your Gators to victory. It?€™s the perfect accessory for an on-the-go UF gal like you! Nothing says ?€œdie-hard Gators diva?€ like this sassy Sports Luxe Hobo purse! It offers a soft exterior with metallic silver carry handles and trim and has a lovely crowned heart design on one side that?€™s accented by fancy flourish details a ribbon that reads ?€œForever?€ and sparkly rhinestones. Of course there?€™s also a hint of Florida flair found in the large heart-shaped pendant which features an acrylic inlay of vibrant team graphics a shimmery rhinestone trim and a football charm. Throw this delectable handbag over your shoulder girly ?€” it?€™s time to show off your Gators fashion! Ladies you have an old faithful bag you carry everywhere. The only problem is that it doesn?€™t showcase your Gators pride. Plus you?€™ve lost at least 20 bucks’ worth of change in the lining! That is why this Florida Grommet cross-body bag has your name written all over it (metaphorically speaking of course). This team-colored nylon bag features cool grommet detailing on the side a domed Gators logo on the front a durable adjustable strap that mimics a seat belt and multiple interior pockets so you can carry this bag while running errands or cheering on your Gators to victory. It?€™s the perfect accessory for an on-the-go Florida gal like you! Every Gators game day you try to squeeze as many items as you can into your purse. One day ?€“ after your guy asks you to hold his wallet ?€“ your purse splits at the seams leaving all of your worldly possessions on the ground. Yikes! Turn that frown upside down and feast your eyes on this UF-spirited Carryall tote. Featuring an embroidered team logo on the front a large zip compartment multiple pockets and easy-to-carry handles this tote is the perfect accessory for carrying all of your Gators game day needs and ?€” if he’s lucky ?€” a few of his too! Nothing says ?€œdie-hard Gators diva?€ like this sassy Sports Luxe wristlet! It offers a soft exterior with a metallic silver carry handle and trim and has a lovely crowned heart design on one side that?€™s accented by fancy flourish details a ribbon that reads ?€œForever?€ and sparkly rhinestones. Of course there?€™s also a hint of Florida flair found in the large heart-shaped pendant which features an acrylic team name and team logo inlay a shimmery rhinestone trim and a football charm. Slip this charming mini purse on your wrist or throw it over your shoulder girly ?€” it?€™s time to show off your Gators fashion! Ladies tote your essentials in UF style with this quilted hobo purse! It features an embroidered team logo a convenient carrying strap and plenty of space for all your necessities making for a darling everyday show of your ultimate team pride. You hardly ever miss a Gators home game ?€” and if you’re on the road while your boys are playing a rival in a nearby city you’re gonna do your darndest to get tickets! Display your UF pride every time you leave the house with the Traveler purse. It features an embroidered Gators logo on the front various pockets a long adjustable shoulder strap and team-colored fabric. When it comes to Florida you’re no fair-weather tourist who’s only there to snap pictures watch a little of the action and move on to something else ?€” you’re a fan for life! You?€™re the type of person who likes to bring your Gators pride along with you wherever you go. The next time you?€™re out shopping or running errands slip this cute Vintage Shopper bag over your shoulder to tote around your necessities while showing off that Florida spirit! It features a large distressed team logo a vintage wash and distressed details to give it a worn look. This bag ensures that others will notice that you?€™ve been a Gators fan for ages ?€“ and you have no intention of stoppin?€™ now! Very few accessories are snazzy enough for the Gators. When you spot something that screams fancy you can?€™t live without it. So get excited about the Helga purse ?€” it?€™s to die for! It features an applique Gators logo embroidered on one side orange panels on the front and back and team-colored stripes printed on the sides for flashy fashion that?€™s perfect for any Florida game day. It also includes a main compartment with a small interior zippered pocket and a woven nylon adjustable strap perfect for throwing over your shoulder when you’re on the go! Hey girl! What goes around comes around and thank goodness the 70s are back! This Groovy bag boasts a mottled distressed exterior featuring yarn-stitched flower graphics around a distressed twill logo on the front with a zippered closure and button toggle detail that really give it a little hippie-dippie flair. The long wide shoulder strap is perfect for a casual over-the-shoulder look while there’s plenty of space inside for your modern gadgets and maybe even a few supplies for making impromptu protest signs about the Gators’ competition on Florida game day. When you prepare for a trip you don?€™t want to pack your precious Gators belongings in just any ole bag. It has to show the same amount of passion as the gear going in it and it has to be easy to carry. If none of your bags meet these requirements then this Hoodie duffel bag with an adjustable shoulder strap is exactly what you need. Not only does the embroidered Florida logo give this bag the required amount of team spirit it?€™s also made to look like your favorite hoodie ?€” complete with a front pouch pocket a drawstring on the opening and raw edge seams. Whether you?€™re hitting the road for an away game or heading down south for spring break this bag will ensure that you?€™re always carrying your UF spirit with you. Ladies whether you’re heading to the stadium or a pre-game rally this purse will hold all your essentials! It features three outer zippers team-colored interior and metal team logo detailing for added Gators spirit!